ChiroTV Network is a web based TV channel for your reception area TV. This customizable service is only $39.95 per month and helps you generate new patients and sell more products and services. Excellent features such as YouTube Integration, Local Weather Forecast, and Scrolling Ticker are all a part of this service. Free 30 day trial. Health Visions, Inc. has been a respected industry leader in waiting room TV chiropractic patient education since 1996, and ChiroTV Network's continued growth has proven that this service is stronger than ever in helping to educate patients and increase practice revenue. 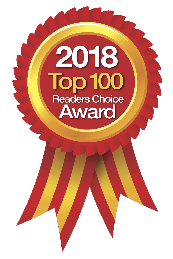 Proud to have provided chiropractors with up-to-date patient education tools for the past 20 years, Health Visions credits their success to not only providing superior and innovative platforms, but also in continuously striving to meet the changing needs of their customers as they build and grow their practices. Today, after 20 years and thousands of chiropractors using their products and services, ChiroTV Network has become the leading choice for patient education on reception area TV. ChiroTV Network is an Internet based TV Channel with a monthly subscription of $39.95 per month, with no contracts or set-up fees. All you need is a TV monitor, computer, and internet access to get started. For that low monthly fee, you can easily customize your network with the scrolling ticker, YouTube videos, local weather forecast, adding your own pictures with text, and more. Additionally, they change the content each week to keep your patient education fresh and interesting. See for yourself why ChiroTV Network has become among the most widely-used chiropractic waiting room TV patient education tool. 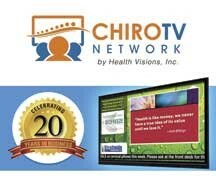 Visit www.chirotvnetwork.com to get your 30-Day Free Trial.